Driving around a city like Manchester can be a challenge in a manual car. The constant stop-start of urban traffic means that you’ll need to spend a lot of your time shifting between gears—just one more irritation you don’t need when you’re stuck in yet another traffic jam. New drivers can also find they experience a bit of a learning curve when it comes to figuring out when to change gears. With so much to take in when learning to drive, many drivers would prefer to simply do away with the clutch pedal and gear stick altogether. Luckily, drivers across Greater Manchester can take automatic driving lessons with PassMeFast. PassMeFast offer intensive automatic driving courses, making it quicker and easier for new learners to get their licence without having to worry about gears. Read on to learn more about whether automatic driving lessons in Manchester are right for you. If you’ve ever driven in a manual car, you’ll be familiar with the traditional gear stick, which typically allows you to choose between five or six different gears, reverse, and neutral. Automatic cars, meanwhile, keep things simpler: P (Park), R (Reverse), N (Neutral) and D (Drive). All you need to do is put the car into Drive, and the car will automatically change gears for you. Automatic cars offer smoother gear changes than manual cars, making them very well suited to driving in a city like Manchester. They also don’t feature a clutch pedal, meaning you only have to focus on two pedals—the brake and the accelerator. Despite this, there are some advantages to learning in a manual car. Firstly, there’s cost: manual cars tend to be cheaper to purchase, cheaper to run, and cheaper to fix. They also offer drivers greater control over their vehicle. It’s up to you to decide whether to opt for an automatic or stick with a manual and choose the transmission that best suits your needs. Visit our ultimate driving terms glossary for full details on many of the differences between auto and manual cars. Drivers in rural areas have the advantage of quieter, more predictable roads. Learning to drive in a city like Manchester means dealing with busy roads—and those dreaded traffic jams. Nonetheless, learners living in Greater Manchester will gain valuable experience by learning to drive in local test centres. After all, you’ll likely spend a lot of time driving in your local area, so it’s important to familiarise yourself with the conditions on roads close to you. Taking automatic driving lessons in Manchester isn’t a silver bullet—but driving an automatic can make urban driving a much smoother, less stressful experience, and could help give you an added edge when taking your practical test. PassMeFast do driving tuition differently. Rather than dragging out the process over months, we can help you get your licence in a matter of weeks, with a fast-track practical test included as standard. While other companies only offer a one-size-fits-all approach, we offer a range of courses tailored to everyone from a complete beginner to a more experienced learner. Though all of our courses can get you your licence quickly, you're free to take your lessons at your own pace, with both fully intensive and semi-intensive courses available. It’s this individual focus that means our pass rate is higher than the Greater Manchester average. Plus, over at the PassMeFast blog, we offer useful advice for all drivers—including those who've long since gained their licence. Each of our courses can be taken in either an automatic or a manual car—it’s completely up to you. Check out our automatic crash courses page for full details and pricing info—or to learn more about how our courses work, check out our guide to crash courses. Our fantastic fleet of highly qualified and experienced driving instructors cover the length and breadth of Greater Manchester—so, no matter where you live, you’re sure to be covered. We offer automatic driving lessons in Manchester, Salford, Trafford, Bolton, Bury, Stockport, Tameside, Oldham, Rochdale and Wigan. 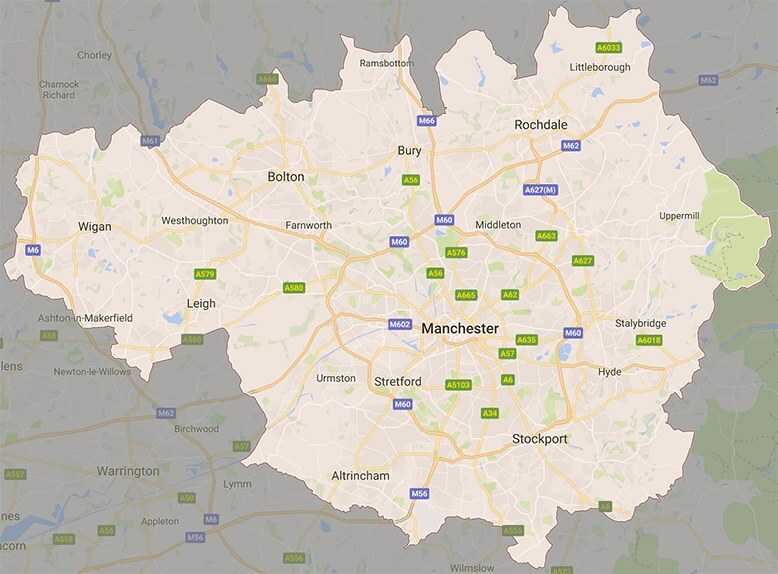 We also cover all 14 practical test centres in Greater Manchester, meaning you’ll be able to take your test close to home on roads you’ll be familiar with and will be driving on day to day. If you’d like us to double-check whether your area is covered, then simply contact us and let us know your postcode. Live outside Greater Manchester? You may still be able to take a PassMeFast course—check out the list of areas we cover for more information.